Jones Abiri has been detained, without charge, since 21 July 2016. 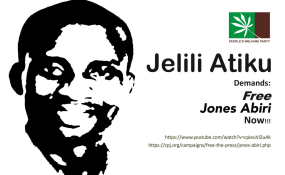 The Coalition for Whistleblower Protection and Press Freedom is calling on the federal government to order the immediate release of Jones Abiri, publisher of the Weekly Source newspaper in Yenagoa, Bayelsa State, who was arrested by agents of the State Security Service, SSS, on July 21, 2016 and has been detained without charge since then. The coalition is contending that regardless of the offence with which Mr. Abiri may subsequently be charged, there can be no justification for his detention without trial for two years, adding that his detention without a court order is a flagrant violation of the constitution and an affront to the rule of law. Quoting news reports, the coalition said on July 21, 2016, nine armed agents of the State Security Service (SSS), Nigeria's domestic intelligence agency also commonly known as the DSS, arrested Mr. Abiri, in front of his office in Yenagoa, during which they searched the office and confiscated various documents. The SSS subsequently emailed a statement to Nigerian journalists on July 23, 2016 accusing Mr. Abiri of being the leader of the separatist group Joint Revolutionary Council of the Joint Niger Delta Liberation Force and claimed that he had confessed to bombing oil pipelines, planning attacks on Abuja, the capital of Nigeria, sending threatening messages to international oil companies, as well as being the mastermind of a hoax military coup against President Muhammadu Buhari. These allegations were shocking to friends and families of Mr. Abiri; they claim repeatedly that he has no connections to militancy in the Niger Delta. The coalition noted that when the New York-based Committee to Protect Journalists (CPJ) contacted the SSS in July and November 2016, the officers who answered the telephone calls said they were not authorised to speak about Mr. Abiri's case. It also quoted Abdulwaheed Odusile, president of the Nigeria Union of Journalists (NUJ) as well as of the Federation of African Journalists (FAJ) as telling the CPJ on October 25, 2017 that: "We don't know where he is and we don't know what he has been charged for." The coalition said it supports a fundamental human rights enforcement suit filed before the Federal High Court in Abuja on behalf of Mr Abiri by human rights lawyer, Femi Falana, in which he is contending that his being held in the custody of the DSS for about two years amounts to an illegal violation of his fundamental human rights. The suit, filed on July 4, 2018, is praying the court to declare that the detention of the journalist in Abuja without access to his family members, friends and medical doctors since his arrest on July 21, 2016 "is illegal and unconstitutional" and claiming N200 million in damages..
Mr. Falana is hinging his claim on the argument that the detention "violates" the applicant's fundamental rights" guaranteed by Sections 34, 35 and 40 of the constitution as well as Articles 11 and 16 of the African Charter on Human and Peoples' Rights (Ratification and Enforcement) Act. The coalition insisted that Nigeria's Minister of Information and Culture, Lai Mohammed, was not telling the truth when he claimed at the opening of the FAJ Congress on April 29, 2018, while delivering a speech on behalf of President Muhammadu Buhari, thus: "I can report to this congress that not a single journalist is being detained or harassed in Nigeria today. This government is not a threat to the media, and it is not about to stifle press freedom or deny anyone his or her constitutionally guaranteed rights." It contended that even if Mr. Abiri had committed murder or treason, of which there is no record of such, he has a right to fair hearing and a trial. The coalition said: "As an organisation that has its mandate based on good governance, anti-corruption as well as an institution that fiercely fights for the protection of basic human rights of its citizens, whistleblowers and press freedom, we denounce the inadequate safety for journalists in Nigeria. Too many journalists are imprisoned for the wrong reasons. Too many journalists are harassed for speaking out against certain government policies." It called on "the Executive, the Judiciary and the Legislature to set up a national mechanism for the safety of journalists and to report on the policies of protection, prevention and justice in place to eradicate impunity for attacks against journalists." The coalition vowed to continue to champion the case of Mr. Abiri until the right thing is done by the government, warning that "if certain elites assume, in their disdain for accountability, that using the state security machinery to bully the press, as in this particular case will intimidate the media from holding the government accountable, then they are mistaken."